Some of the troll network’s multiple fake personalities and stolen photos. But whoever it is, they are clearly attempting to smear Labour as an anti-Semitic party. It is well established that Israel has been running both covert and overt efforts against Jeremy Corbyn since he became leader. Anti-Palestinian groups working in coordination with Israel are running covert social media campaigns. A recent example was revealed in the suppressed undercover Al Jazeera investigation, The Lobby – USA. As that film showed, The Israel Project is running a campaign to infiltrate pro-Israel narratives into popular, and otherwise innocuous, Facebook pages. “There are also things that we do that are completely off the radar,” the lobby group’s managing director told Al Jazeera’s undercover reporter. Last month, another covert operation was revealed after its documents leaked – this one run by the British state. The so-called Integrity Initiative was launched in 2015 and is directed by British military intelligence officials. The UK government conceded after the leak that the initiative is being funded by both its foreign and defense ministries – over $3 million to date. Among the shadowy group’s targets has been Labour leader Jeremy Corbyn. The network of Twitter accounts investigated by The Electronic Intifada uses a series of fake names and profile photos. Their followers lists also include many dubious looking accounts, strongly suggestive of bought fake followers. All 10 accounts have engaged in a pattern of deception, presenting as Labour activists while engaging in anti-Semitism. Most have also posted violent incitement and death threats, often against Jews. All 10 posted their most violent and anti-Semitic content as replies to other tweets. This means that many times, a cursory look at the accounts’ profile pages is unlikely to reveal anything immediately objectionable. Most of the accounts’ more public-facing tweets are legitimate Labour Party or other political material. Two of the accounts have also posted legitimate Palestine material. Some of the legitimate Palestine solidarity material posted or retweeted by two of the accounts. The targets of the troll network have often been high-profile Israeli, pro-Israel or Labour accounts. They have included Israeli Prime Minister Benjamin Netanyahu, right-wing Labour MP Yvette Cooper and Jeremy Corbyn himself. All 10 accounts present themselves as belonging to Labour Party supporters, activists or even staffers. Reverse Google Image searches confirm that seven of the 10 profile images are stolen photos – the other three are likely screen grabs from videos. Six of the 10 profiles present as ostensibly Muslim – it is these profiles that have posted some of the most disturbing anti-Semitism, including direct calls for violence against Jews. These accounts have Arabic names including “Abu Hussein” and “Abu Omar” while using stolen photos, some of actual or alleged Islamists or Islamic extremists. One such photo is of Muhammad Qutb, the late brother of influential Muslim Brotherhood ideologue Sayyid Qutb. Surviving Twitter evidence shows the troll network dates back to at least November 2015. Five now-removed accounts: @WesleyBrownLab, @AbuOmarLab, @AbdulMahdiLab, @LabSaleh and @DeanBrownLab. Two now-removed accounts which The Electronic Intifada was able to take first-hand screenshots of while still operational: @AbuHusseinLab and @CharlesBrownLab. Three still operational accounts: @LabAbuHussein, @LabAbuYami and @dgrintz1. The latter was posting as recently as December. Three of the 10 were first exposed by Labour news site The Skwawkbox in 2017 and 2018. The troll network’s tweets appear intended to provoke an outraged response at “Labour anti-Semitism,” thus fueling the crisis. There have been several reported instances of just such outraged responses, from right-wing Labour lawmakers, and even in one case an Israeli government spokesperson. An example of how the troll network helped drive the crisis took place on the final day of Labour’s 2016 annual conference. At the time, there was a media uproar about supposed Labour anti-Semitism. This resulted in Black Jewish anti-Zionist activist Jackie Walker being suspended by Labour after she disagreed with Israel’s preferred definition of anti-Semitism at a supposedly private training session. 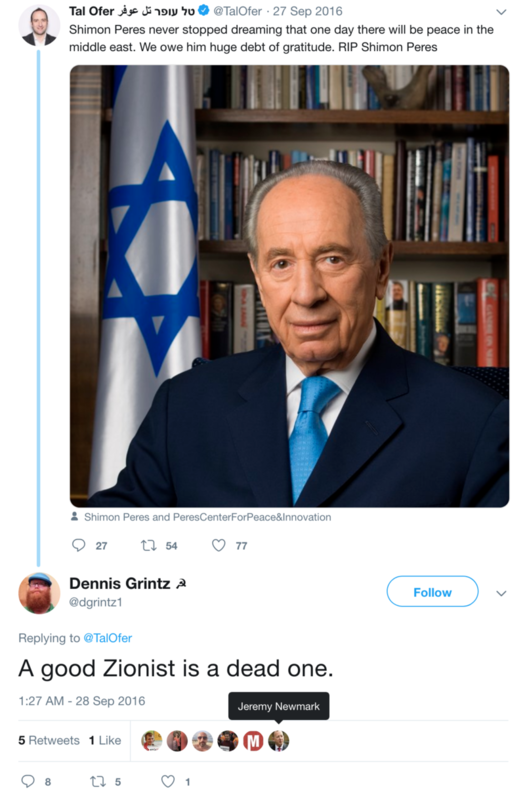 In this febrile atmosphere, the @dgrintz1 account tweeted that “A good Zionist is a dead one” at Tal Ofer – a British-Israeli member of the pro-Israel Jewish Labour Movement, a group that has driven the “Labour anti-Semitism” narrative from early on. This reply-tweet was subsequently retweeted by Jeremy Newmark – then the JLM’s chairperson, though he was later forced to resign in disgrace. The JLM has intimate ties with the Israeli embassy. Another typical example occurred in March 2018, during a renewed media frenzy over the supposed crisis. A new account, “Abu Hussein,” began retweeting Corbyn, his senior Labour ally John McDonnell and other popular Labour accounts. But a closer look at @AbuHusseinLab’s profile revealed a disturbing picture. In a reply targeting Corbyn’s and McDonnell’s official Twitter accounts, “Abu Hussein” threatened “Jihad” against “Jews,” alongside a bloody graphic of a knife. But the account had stolen its profile photo from a dating site. “Abu Hussein” was reported to Twitter for violent racism by this writer and other Twitter users. But the troll network simply opened more accounts – at least four of its supposedly Muslim accounts began tweeting in April 2018. That same month the crisis over alleged anti-Semitism continued to rage in the party. And Israel’s ostensibly opposition Labor Party openly drove it, generating headlines by suspending relations with Corbyn’s office over his “hatred of the policies of the government of the state of Israel” and alleged anti-Semitism. In October 2018, a new fake Labour account began tweeting: @DeanBrownLab. “Dean Brown” claimed to be a “former Labour party staffer” and a member of Momentum – a group which emerged from the campaign to elect Corbyn as Labour leader. The account promptly disappeared. The goal of smearing Labour activists as anti-Semites had been achieved. But as The Skwawkbox soon revealed, Labour sources emphasized that no Dean Brown has ever worked for Jeremy Corbyn. Momentum also confirmed it had no membership record of any Dean Brown. The profile photo the account used was of someone totally innocent and was stolen from a local press report. This troll network shows how easy it is for an individual or small group of people to convey a false impression on social media. Despite there being no evidence that “Wesley Brown,” “Abu Hussein” or any of the rest even existed – let alone that they were Labour members – the troll network fooled several high-profile politicians. This was easy to do, since the fake profiles fit into a preconceived narrative that anti-Semitism is rife within Labour, especially in the pro-Corbyn left. Those who created the fake accounts also exploited Islamophobic prejudice that anti-Semitism is endemic among Muslims, including activists within Labour. When the dominant media narrative is so often based on fabricated evidence, a serious reappraisal and extreme caution about future claims are overdue. Asa Winstanley is an investigative journalist and an associate editor with The Electronic Intifada.